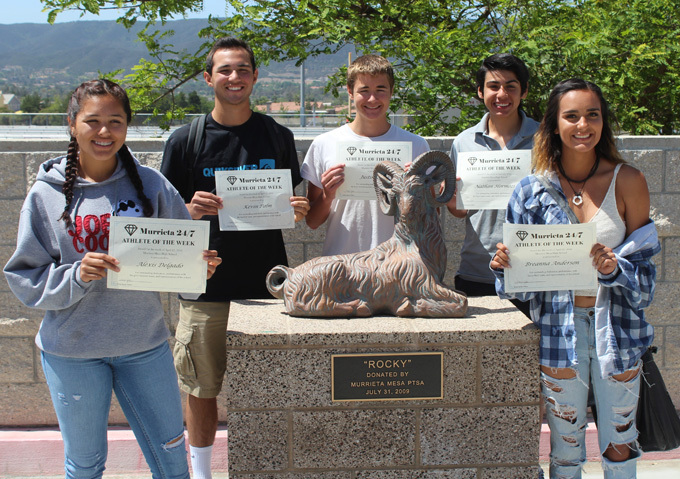 From left: Alexis Delgado, Kevin Palm, Justin Grant, Nathan Hormozi, Breanna Anderson. Not pictured: Nolan Fisher. Kevin Palm is batting .384 for the Rams baseball team, which is 20-4 this season and 10-0 in league play. He also is 4-0 with a 0.82 ERA as a pitcher. Sophomore outfielder Breanna Anderson had two game-winning hits for the softball team, which is 12-9 overall. She is batting .412 with 16 RBIs. Freshman Nolan Fisher is honored for his consistent performances with the golf team. Justin Grant of the boys swim team has helped two relay teams achieve CIF consideration times and has achieved three individual event consideration times. Nathan Hormozi "is a major asset to the tennis team as a freshman and he will be one to watch in the years to come," said his coach, Lisa Laney. "He is one of my top singles players." Alexis Delgado is a repeat winner for her continued success with the girls lacrosse team.